While we all love to gaze at photos on Pinterest or Houzz of beautiful, spacious walk-in closets, the reality is that many of us just don’t have the option of a walk-in closet. 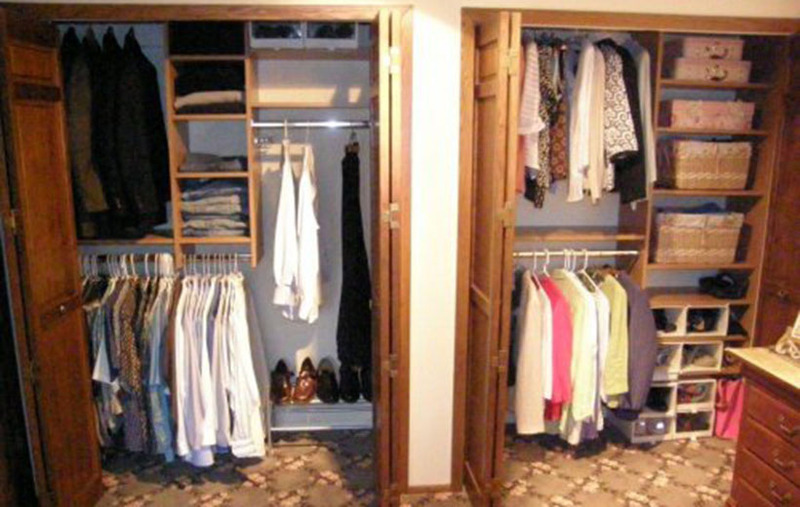 Many older homes were built before walk-in closet space grew into a mainstay of home design and own homes with reach-in closets instead. However, just because a home has reach-in closets, doesn’t mean you can’t have smartly designed closet space that feels mighty! A custom closet organization system designed specifically to meet your needs and your space will maximize storage potential in your reach-in closet. Features such as dual hanging closet rods, built in drawers and custom shelves will have your closet space working over-time to keep your clothing organized and tidy. In addition, the multitude of closet accessories available can add significant storage potential without taking up valuable closet real estate. Space saving accessories include pant hangers (pictured to the left), tie and belt racks, pull out hampers and more. And while you may be tempted to visit your local home store to do it yourself, we urge you to at least contact a custom organization company (like Closets For Life!) for a free in-home consultation to see what we can do for you. Our experience means we know what questions to ask to assess your needs to design a system that you won’t out grow and that won’t fit awkwardly in your space. We are also able to offer customized options not available from a cookie-cutter system like textured finishes and custom pieces to meet specific needs.